Greetings, blogging friends. I’m baaack! At least I think I am. I seriously thought I’d never be back. I’ve returned from a ten-day trip to Los Angeles, fun-filled with chlorine, ocean spray, and not enough sunscreen. I swam in the ocean for at least an hour and the water never felt so warm at 70 degrees. Can you believe that? If I could grow a pair of fins, I would have moved in. I seriously reconsidered my position in life. I don’t belong inland. I would have come back sooner, but I had so much visiting to do with family and a few of my friends. Marilyn twirled by, looking ever so lovely. I know you can’t blame me for taking the time to catch up with her. And this guy…Mr. Frankenstein. He followed me everywhere. I barely made it inside my car and that was after I had a drink with him. My plan was to introduce Frankie to Norman, so he would move on and forget about me, but apparently not. Norman Bates, you see, was up to his old tricks. Do you see that he’s putting a body in the car? Norman, Norman, Norman…. Had I not been running, I would have snapped of photo of him coming after me with a knife. Friends, I barely made it out alive. I was sweating and hysterical and thought that Fred, my best alien friend on the planet, could help me. But he couldn’t be bothered to wake up. I’ll have to admit I was upset about this. I could have sat in that chair. He’s going to be really disappointed when he finds out that I stopped by. Instead, I partied with a bunch of mummies. Most of the pictures are from the Studio Tour, which was without a doubt my favorite ride. The sets were very cool. The Revenge of the Mummy was a close second. That’s me and my son on the mummy ride. I was shocked to see the fear on my son’s face here. You’d never know it on the ride because he laughed the whole way through. The ride is in absolute darkness and when it was it was over, we said, “Again!” So fun. This ride was the only actual roller coaster at the park; the others were all 3-D simulations and were incredible. Quite the thrill! I had never experienced anything quite like this; there was free-falling from high buildings and being shot at by Optimus Prime and actually feeling the heat of the bullet. Or how about the feeling of bugs crawling up your legs or being tossed around by King Kong? The fun never stopped. You really felt like you were inside the ride and you either loved it or hated it. It’s not for everyone. My husband went on a ride and promptly threw up. Oh, well! Perhaps, an amusement park experience is not complete unless someone gets sick. 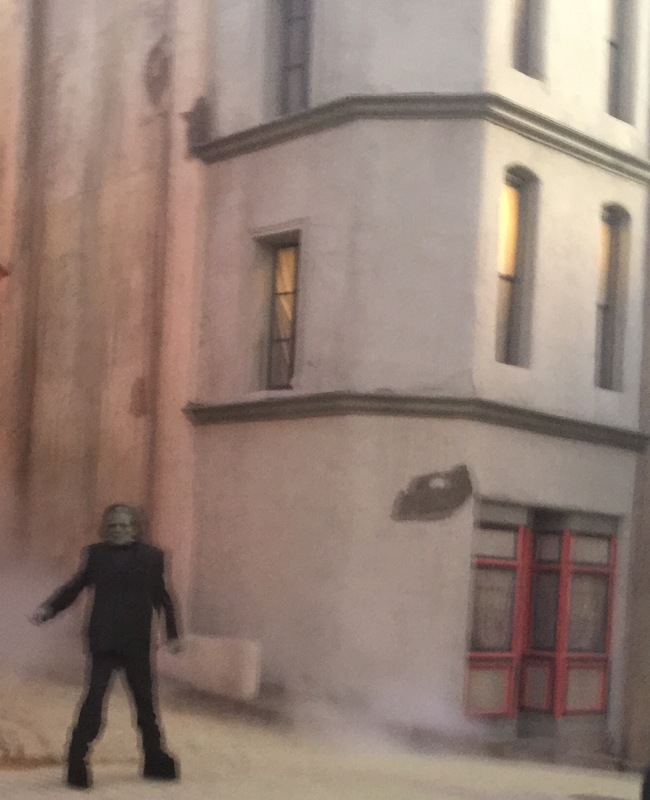 Here’s one more cool shot from the Studio Tour. It may look familiar. It’s from the Jaws set. It was difficult taking photos through the bars of the tram. Anyway, I hoped you enjoyed them. I’m back and I’m safe. How have you been? It was a lot of fun! Good to see you, Dawn. It sounds like you had a great trip. I do hope that Marilyn keeps away from Norman and his dastardly mother! I think Marilyn knows better. I sure hope so! Welcome back! Sounds like you had a wonderful time. We’ve been to Universal Studios in Orlando but not LA. Always one of our favorite places to visit. Glad you enjoyed it! Thanks, Carrie. Universal Studios was a fun place. Kids had a good time. It feels good to be back in my own bed and in my own space! Thanks, Dianne! I just had to get it! 🙂 I don’t know how much longer he’ll have that look. I love them too! And so does my son! I will ride anything – no fear at all. Guess that makes me a thrill – seeker?! And you’re one too! Love that picture of the two of you-very cute! I knew you were a thrill-seeker! I like being just a little bit afraid. Although I don’t feel the same kind of fear on a 3-D ride as I do on a scary roller coaster that you can see while you’re standing in line. 🙂 Thank you! I agree – and those 3D rides are incredible! We’re just kids at heart I guess! It’s the best way to be, Kelly! I’ll ride roller coasters as long as I can. Deal! I don’t think there are any restrictions on old ladies! Just keep your heart in shape! Ha! Thanks, Ralph. I hope so. I’m ready for normal. 🙂 Sounds good to me. Glad you had a fab time! I’ve been to Universal in Florida and loved it! It was quite a few years ago now, would love to go again. I’m not into the real thrill roller coasters that you get at some theme parks, I much prefer the more visual effect and experience type things that you get at Universal. Thanks, Vanessa. The visual effects ride is a completely different experience! It’s up there with roller coasters for me. It doesn’t have the limits of roller coaster. You just don’t know what you’re getting into either. I much prefer Universal over Disneyland. Thanks! It’s always good to getaway from it all. The best part really is wanting to come back, Michael. I feel exhausted, but refreshed in a way. Its good you are refreshed, I guess that’s the whole point of getting away. Now this looks like a great getaway vacation, Amy, just what you needed. A trip to the drama capital to release your every dose of it. Perfect. Welcome back, my friend. And, yes, in the mummy shot, you look totally relaxed while your son looks … well, check the drawers! It was fun, Mark. Thanks! The best part was really swimming in the ocean. I like the simple stuff! 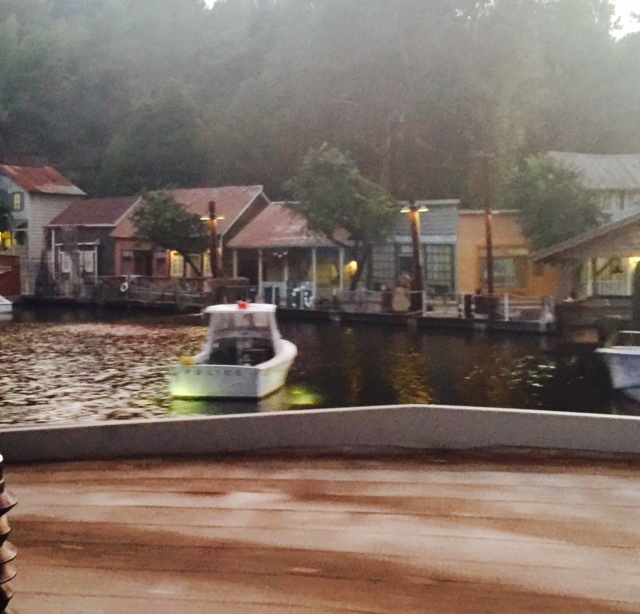 Universal Studios was a great time, too! I would go again. They’re always changing it up, too, so you never know what will be there next time. My son won’t admit it, but I think he was definitely afraid. The Specific Ocean! Very funny! It was a bathtub. I didn’t want get out, Mark! I wish you could have swam to your heart’s content, Amy. Thanks, Mark!! I did! I just wish I had a bit more time there. Hey, Audra! It was a great time, mixed with a few tense times, too. You know how it goes! Thanks so much. Cheers to you! One of my favorite memories with my mom was going to Universal Studios in Orlando. She asked me if we were going to get splashed on the Jurassic Park ride. I was, like, “No, Mom, you should be fine. I’ve been on this one a hundred times and if you get splashed it’s barely at all.” She was in Orlando for work and had to go back for a meeting afterwards. Sure enough, we got splashed. She was soaked and I was totally dry! I felt awful, but she just laughed it off and we had a great rest of the day while she dried off. I’m sure your son will remember this fabulous trip with you for years to come. Great post. Thanks for sharing! I’m sorry. I know you wrote all sorts of words and shared all sorts of pictures, but you had me at this … “I swam in the ocean for at least an hour and the water never felt so warm at 70 degrees. Can you believe that? If I could grow a pair of fins, I would have moved in.” It reminds me of my one trip to Hawaii about eight years ago. I have never spent as much time playing in the ocean as I did during that week. The water was so warm. My boys and I played for hours in the surf. Body surfing, boogie boarding, snorkeling. If I could, I would have never left that water. Yep! You sly one. You totally found me out. That was definitely the best part of trip, Mark. 🙂 I didn’t want to leave and was sad we only had one day for the beach. The weather wasn’t the best. It was pretty cloudy and a little cool. Usually, I need to feel really hot to dive in the ocean. But, I knew I had only one day, so I went and guess what? It was warmer in the water! I know, nothing beats swimming in the ocean. I totally get that! It’s a slice of heaven. Welcome back, Amy. Isn’t is easy being away? Your visit to Universal Studios brings back memories, but the tour I attended when I was a kid in 1971, had far fewer bells and whistles (and actors playing iconic characters) than what you experienced. 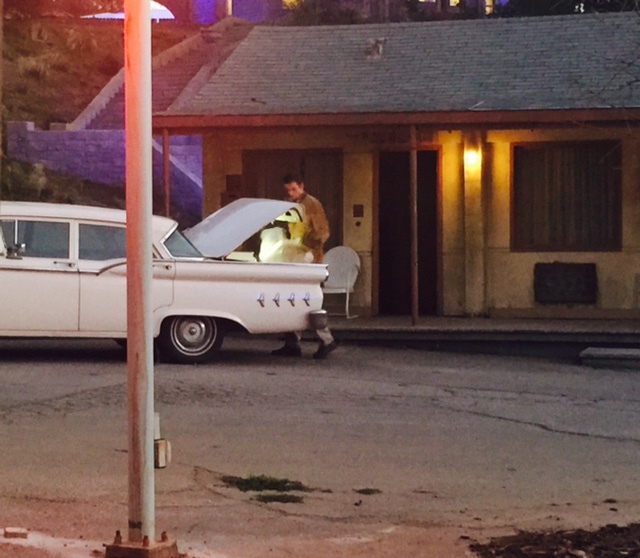 Probably the only thing in common with the tour of today and when I went, is when the tram drove past the “Psycho” house. That seems to never get old. Thank you, Virginia! Yes, the time flies by. Lately, the days aren’t long enough. Well, this was my first visit to Universal Studios so it was all new to me! 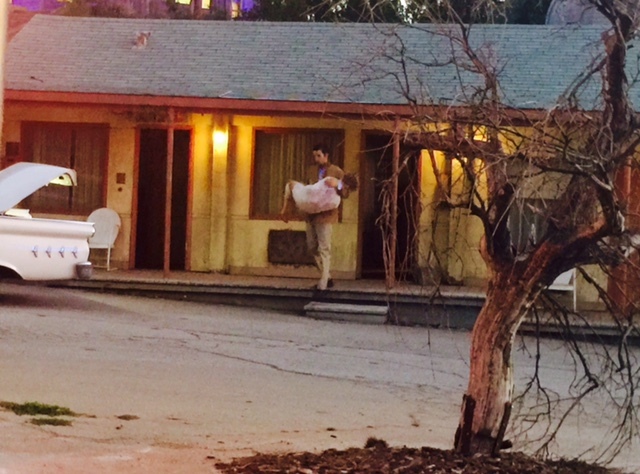 I thought the whole “Psycho” house, etc. was pretty cool because I didn’t expect it. The bells and whistles are pretty extravagant. I can’t even imagine how much further they’ll take it, but I’m sure they’ll figure out a way. I imagined whole movies like this. It made me want to check out the D-box movies. I don’t know that I could handle two hours of it though! That might be a little much. I can’t bring myself to pay $20 for the D-box movie experience, but now since I’ve been on these 3D rides, I’m curious. I’m sure it’s not as intense as a ride, but I wonder how it compares. I usually like Pixar flicks. I’m glad it was done well. It seems like a great subject for kids. It’s a great subject for everyone and very well done! I’ll have to go see it! Ah – sounds like you had a great time Amy! 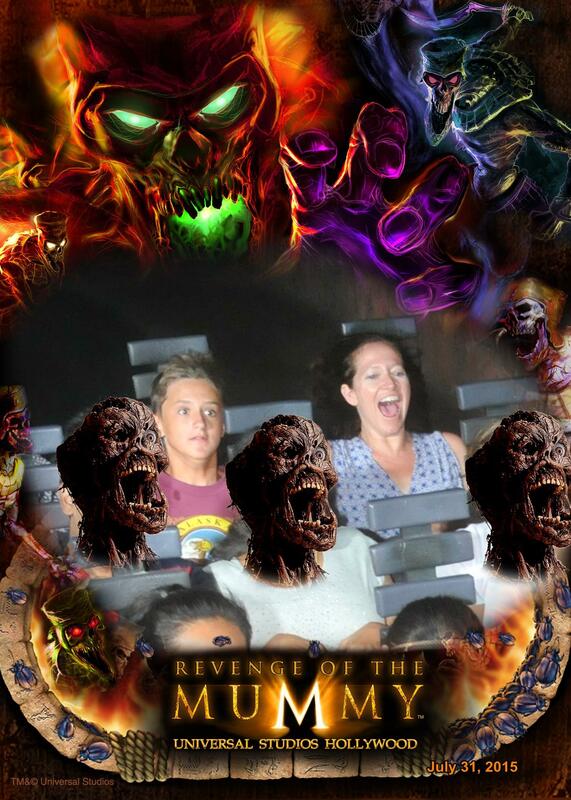 The photo the Mummy ride is priceless. Hope you find your way more permanently back to the ocean one day. Thanks, Trent. I got to get that shot while I can. He’s Mr. Tough guy, but not on a roller coaster. 🙂 Thanks, I hope so. That would be nice to breathe ocean air again. Welcome back, Amy …. and i can tell that you definitely enjoyed yourself. Getting away is always a good thing, and you had a blend of visiting & doing the tourist thing. Cheers! Thank you, Frank. I had a good time being a tourist. I’d never been to Universal Studios. I had a great visit with my mom, too, although that bit could have been longer. Wonderful trip! This must have inspired all sorts of creepy fiction in you. Can’t wait to read it!! Thanks, Jen. Could be, could be. I hope so! I like your pictures. They each capture the moment in a great way. Mr. Frankenstein…ahhh! Scary! The effects are great. Like you were trying to get away from him. Or crouched behind a car to capture Norman – you can’t be too careful with that boy when he gets in one of his moods. Thanks, Adam. Good to see you. I do think that photo is priceless! And it was one of those priceless experiences, too. I’ll always remember it. Welcome back, Amy. Sounds like you had a good holiday… and you took some great photos to boot! Thanks, Tom! I managed a few photos. 🙂 Yes, I snapped away like a mad woman. 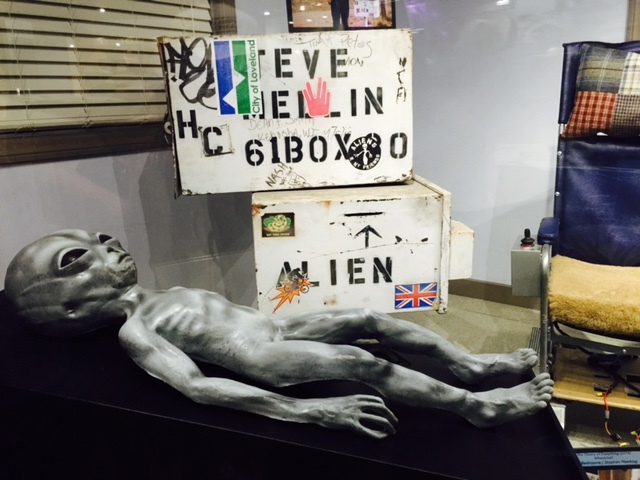 That’s awesome – we were in LA last month too, and also went to Universal! What a coincidence! What did you think of it all? Had you been before? Glad you’re back safe and sound. Those rides make me urp. Oh, sorry about that. I understand these rides aren’t for everyone, but they’re so fun. Thanks for sharing your trip. That was pretty fun. The only time I remember my dad ever took we kids to a movie was to see “Psycho”. Yeah, that was fun. LOL thanks for stopping by. Well, he picked a good movie for you to see, although a bit on the scary side! I’m glad you enjoyed my trip. I’d go back there. I liked it better than Disneyland. This looked so coooooollll!!! Very jealous. Thanks for all your dedicated reading. I really appreciate it!! Thank you. It was pretty cool and fun!! !